The following selected artist's books date from 1979 - 2005. Most were made as gifts for friends and a few were reproduced in underground poetry magazines. Produced while working in the Information Resources Centre of Sydney College of the Arts in 1979-81. Combines photocopied images, drawings, and text on tracing paper interleaved pages. Concept - the images and ideas (mythologies of place and culture) of a foreign "other" country always preceed the physical act of going and being there. Produced with a typewriter and collaged images from fashion magazines. Reproduced by photocopier then inserted into an edition of Magic Sam. The identification of written dialogue with photographic portraits (authorship) is forged then disrupted by turns. A play on acting out our lives in sympathy and antipathy with Hollywood films. 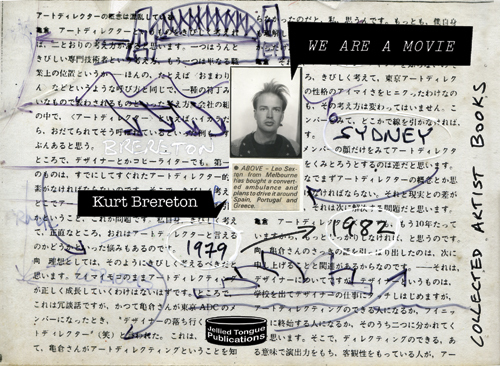 A live audio performance by Kurt Brereton at the Lee Marvin Readings in Adelaide took place in 2008. An image and text response to travelling to the inland sea of Japan in 2005. In 1979 the author produced a limited edition book titled I've Never Been to Japan. Having never been to Japan, the author's ideas of Japan were formed from imported media, films, TV and literary myths. This is in part a response after the fact of actually travelling to Japan and the impact of cultural slippage (in semiotic terms). This collection of artist books brings together for the first time eight one-off books produced largely for friends and family as gifts. The exception is We Are A Movie that was published in Magic Sam # 6 in 1981. The time frame is between 1979 and 1982. Alternate Returns, produced for Sal Brereton in 2001, is stylistically continuous with the earlier works, and on those grounds, demanded to be included.